Mira Conference Tables - IN STOCK! FREE SHIPPING! Mira Conference Tables deliver a timeless, classic design with rugged construction that will stand up for years. 6' Oval Conference Table sold above. Other sizes available below. * All hardwood veneer surfaces are beautifully finished in your choice of a Medium Cherry finish on Cherry Veneer or Espresso finish on Walnut veneer, with a durable protective coating for excellent wear on a real wood table. 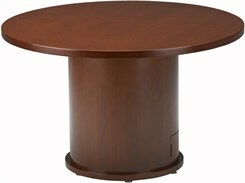 * Table surfaces are a full 1-1/2" thick with 5mm solid wood edge. * Barrel base design is both sturdy and attractive. * Bases feature "trap door" cable access at floor. 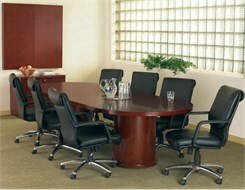 6' Oval Conference Table measures 72"W x 36"D x 29"H overall. Shpg. wt. 155 lbs. PRICE INCLUDES SHIPPING! (Truck shipment - See Terms & Conditions). Please allow 1 week for delivery. Measures 96"W x 48"D x 29"H overall. Shpg. wt. 305 lbs. PRICE INCLUDES SHIPPING! (Truck shipment - See Terms & Conditions). Measures 42" Round x 29"H overall. Shpg. wt. 117 lbs. PRICE INCLUDES SHIPPING! (Truck shipment - See Terms & Conditions). 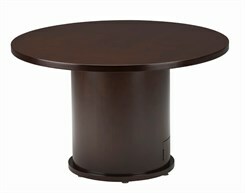 Measures 48" Round x 29"H overall. Shpg. wt. 124 lbs. PRICE INCLUDES SHIPPING! (Truck shipment - See Terms & Conditions). 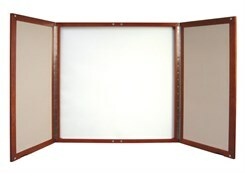 Measures 48"W x 3"D x 29"H overall. Shpg. wt. 82 lbs. PRICE INCLUDES SHIPPING! (Truck shipment - See Terms & Conditions).